Advance Health Care Directives: Why Does It Apply to Me? Pre-planning ensures you have thought about what could possibly happen in the future. An advance directive allows you to give your loved ones a guideline on how you want your health care decisions handled. By considering your options early, you can minimize your family needing to “guess” how you would want critical medical care decisions handled. This alleviates stress for everyone: you, your family, your doctors, etc. Anyone 18 and older can make an advanced directive so even if you think it does not apply to you now, you should still pre-plan. An advance health care directive lets your physician, family, and friends know your health care preferences – what you want and do not want. This includes decisions about special treatments at the end of life, diagnostic testing, specific surgeries, organ donation, etc. Perhaps you are against a certain treatment; you can opt out of the procedure in your advance directive. The advance health care directive is important because it gives you the ability to still make your own choices, even if you can no longer communicate. 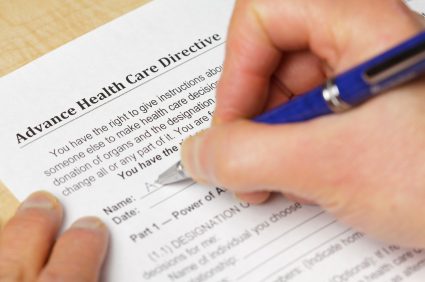 How do I create an Advance Health Care Directive? In order to be credible, the advance health care directive must be signed by two qualified adult witnesses or witnessed by a notary. The witnesses must sign the form on the same date it is signed by the person making the advanced health care directive. However, if you live in a nursing home, a residential care facility for the elderly or in an assisted living facility, the document must be witnessed by a representative from the Long-Term Care Ombudsman Program in order for the advance health care directive to be valid. Start your own Advance Health Care Directive. What is an “Agent”? How do I choose one? You can also have your agent make decisions for you right away even if you are still able to make your own decisions, or at a later date, when you become unable to make your own decisions. Your appointed agent is generally a person who you trust, such as a family member or your attorney. By appointing that individual as your agent, you are asking him/her to manage all your health care needs. However, if you cannot decide on an agent, you do not need to choose one. As long as your advance directive is witnessed by two qualified adults, it is valid and your stated preferences must be followed. You can always choose to appoint an agent later. An operator or employee of a community care facility or a residential care facility where you are receiving care; your doctor(s); or an employee of the health care institution where you are receiving care, unless your agent is related to you or is a coworker.